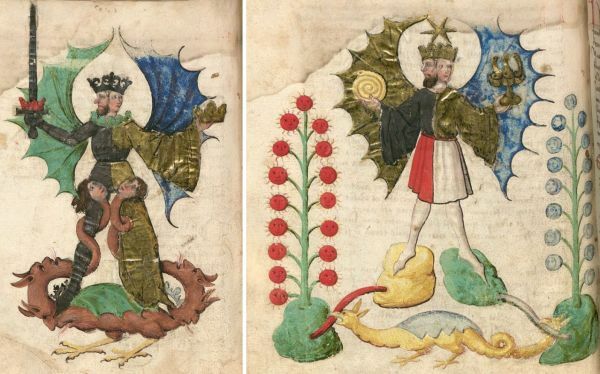 Das Buch der Heiligen Dreifaltigkeit (Book of the Holy Trinity) is one of the earliest alchemical manuscripts containing emblematic symbolism. It is also of importance as its text used the Trinity and Christ's passion to allegorise alchemical content. This became very influential upon the alchemy that developed in the 16th century and later. 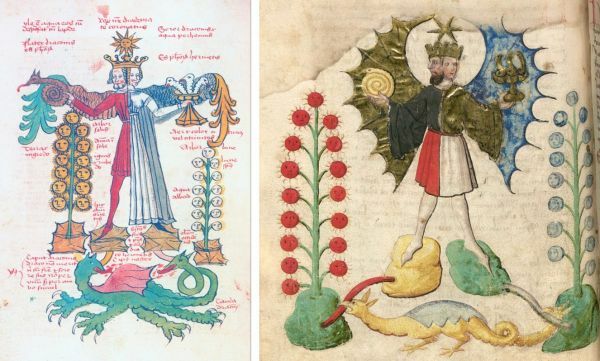 About 23 manuscripts have survived, not all from the early period, and many of them contain the series of alchemical emblems, some with high quality coloured drawings, others somewhat less competent, though in general the symbolism is preserved with only a few relatively minor variations. The manuscripts are complex and fall into three groups, which scholars have investigated. We will look at a number of these images in this discussion forum over the coming months, but initially it would be interesting to consider the two images of the hermaphrodite that appear in these manuscripts. 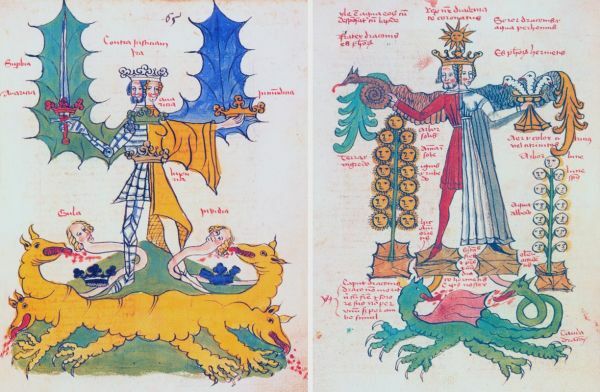 The Buch der Heiligen Dreifaltigkeit is not only an alchemical treatise using medical metaphors of regeneration and rejuvenation, but also contains elements of Christian prophecy. It is thought to have been written by a Frater Ulmannus who may have been of the Franciscan Order. In the series of usually 18 emblems, there are two very similar images of a hermaphrodite. We can see from the text that these are referred to as the Antichrist or Luciferic hermaphrodite and the Mercurial hermaphrodite. 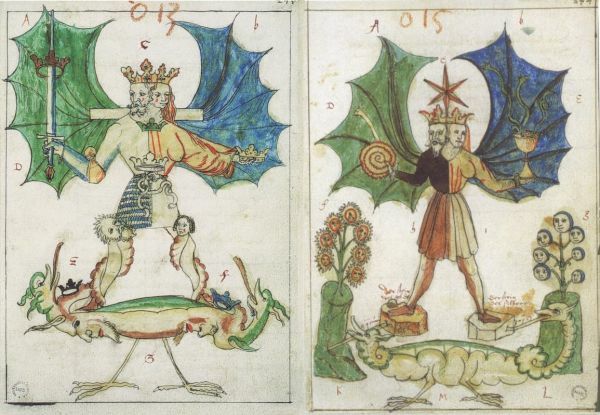 In most manuscripts these illustrations appear close or next to each other and in the order Antichrist - Mercurial. We will first look at examples from some of the manuscripts. First let us look at the version in the manuscript in Munich (CGM 589). Here are the two hermaphrodites on facing pages in MS German 1 in the John Rylands Library in Manchester. This Basel manuscript of 1550 (MS L IV 1) appears to contain the drawings of the Buch der Heiligen Dreifaltigkeit images that were used to make the woodcuts printed by Hieronymus Reusner in his book entitled Pandora of 1582 . 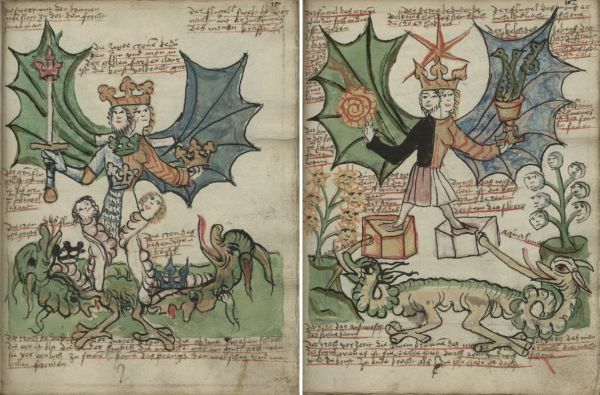 Let us first look at the Antichrist, Diabolic or Luciferic hermaphrodite, and we will here use the illuminated image from possibly the earliest version that in Nürnberg, Germanisches Nationalmuseum, Hs. 80061, dated to 1420 by the scholar Barbara Obrist, and on the right that of the beautifully illuminated manuscript in Munich which is some fifty years later. The figure is entitled 'Contra justiciam' (against justice). First we note from the Nürnberg that the left side of the hermaphrodite's body with the female head has gold leaf applied to her costume. The male side might appear to be in dark grey or black but this is actually tarnished silver leaf. We often see this in illuminated manuscripts, even to the point that some people have come to believe that they are seeing a black sun, when it is merely a tarnished silver moon (as in the Aurora consurgens). We can look at the black sun image in some later posting. The male is clearly wearing a suit of armour and brandishes a sword. There are seven differently coloured crowns placed upon the body of the hermaphrodite: at the head (silver), chest (green), belly (black), right hand (red), left hand (gold), right foot (grey) and left foot (blue). The colours vary in the different manuscripts. Each of these is labelled with one of the seven deadly sins: head (anger), chest (avarice), belly (luxuria), right hand (pride), left hand (impurity), right foot (gluttony) and left foot (jealousy). One could associate these with the seven planetary metals, but I am not sure if this is made in the text. Red obviously to Mars, silver the Moon, gold Sun, green Venus, the blue and grey at the feet possibly to Jupiter and Saturn, with the black at the waist perhaps being Mercury. This Luciferic hermaphrodite it is likely to emblematise the Christian view of the fall of Man, through the work of Lucifer, creating the seven sins and leading Man away from God. A parallel may be being made with the metals and their perceived corruption, and that alchemy can transform the base corrupted matter into spiritual gold. 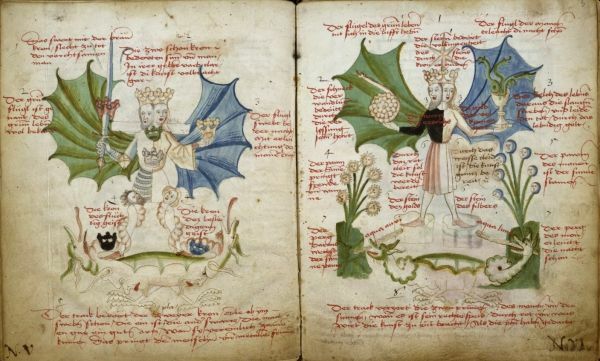 The hermaphrodite stands on a winged demonic dragon with four faces breathing fire. From both its tail and head also emerge snake like necks, each bearing a head, the one on the right male side of the hermaphrodite being female while that on the left female side of the hermaphrodite appears to be male. The Mercurial Hermaphrodite in the Buch der heiligen Dreifaltigkeit might appear at first glance to be merely a different version of the same image. Here we have a winged hermaphrodite standing above a dragon and holding objects, but its form and intension as an emblem is quite different. The hermaphrodite here is crowned with a diadem, the usually six pointed golden star. 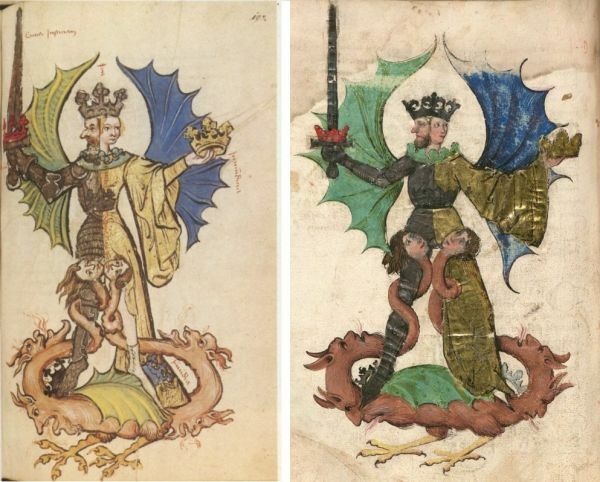 Here I show the versions in the St Gallen and the Munich manuscripts. Sadly I have only been able to obtain a poor quality black and white image of the Nürnberg, but the St Gallen is very similar. This hermaphrodite, in contrast to the Luciferic one, does not stand on a dragon, but has each of its feet placed on a small hill or rock. From out of these two rocks flows a stream, that from the left female side of the hermaphrodite is white and is labelled the 'Oil of the West', while from the stone on right male side emerges a red stream, the 'Oil of the East'. These flow into two little hillocks from which sprout, on the male side the arbor solis (the solar tree), and on the female side the arbor lunae (moon tree). In the St Gallen, the flowers are coloured gold and silver respectively, while the Munich has red and white flowers - the colours vary in different manuscripts. The Rylands manuscript labels the stones as the Stone of Gold and the Stone of Silver, and the streams as the golden water and the lunar water. The dragon here is not demonic, but serves to unite the two streams emerging from the rocks and its head and tail are drinking from these. Labels at the top on the male side suggest the brother of the dragon is the Philosophers' Stone, while on the female side the sister of the dragon is the Aqua Perennis (the enduring water, the water that gives eternal life). The male side of the hermaphrodite holds a coiled serpent, while the female holds a chalice containing three serpents. In the St Gallen the male side of the hermaphrodite wears red and the female side white, while in the Munich the top part are coloured gold and silver leaf, but their skirts are red and white. We can now perhaps see this mercurial or hermetic hermaphrodite as being a transformation of the Luciferic hermaphrodite which symbolised the fallen state of the world, both that of humans and metals. Through alchemy this will be transformed into positive qualities both in Man and metals.